richard cheese, down with the sickness, zombies, baycon, book release party, emerian rich, h.e. roulo, j. malcolm stewart, laurel anne hill, sumiko saulson, loren rhoads, lillian csernica, seanan mcguire, earthquakes, horroraddicts on kindle, babadook, netflix, chiller, lifeforce, colin wilson, the space vampires, tobe hooper, texas chainsaw massacre, mathilda may, siren, slasher, stack.com, death note, adam wingard, the woman in black, horror addicts guide to life, sandra harris, ron vitale, david watson, books, plague master: sanctuary dome, zombie dome, slicing bones, kindle buys, morbid meals, dan shaurette, london mess, fox uk, canniburgers, the walking dead recipe, nightmare fuel, japanese fable, slit mouth woman, surgical mask, particle son, revelation, portland band, dawn wood, stephen king, clive barker, grant me serenity, jesse orr, black jack, the country road cover up, the sacred, crystal connor, dracula dead and loving it, kbatz, kristin battestella, c.a.milson, the walking dead, dead mail, candace questions, colette, bees, david, bugs, the watcher in the woods, pembroke, jaws, gremlins, craig, devil, sparkylee, the thing, dogs, kristin, alien, robert, magic, daltha, clowns, pennywise, jaq, creature from the black lagoon, jody, night of the living dead, world book day, interview with a vampire, michael, haunting of hill house, kbatz, frankenstein, dracula, anne rice, jane eyre, sumiko, the stand, lillian, jim butcher, changes, a.d., exorcist, mimielle, firestarter, bad moon rising, jonathan mayberry, edgar, alabama, alien from la, kathy ireland, ask marc, marc vale, mike, pittsburgh, driver’s test, what would norman bates do?, mother, voices, psycho, h.e. roulo, heather roulo. When I was looking for horror books for the seventies it didn’t take long for me to come up with a list of books to talk about. The seventies and eighties were a great time for horror novels. 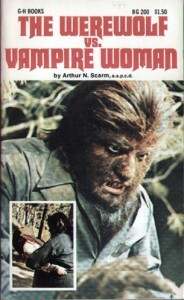 One of the most intriguing books I found was one written in 1972 called The Werewolf vs. Vampire Women by Arthur N Scram. This book is supposed to be an adaptation of a movie that was released under the same name in 1971 but according to what I read, the book doesn’t follow the movie. The book begins in a morgue where a man called Waldo who happens to be a werewolf is lying in a morgue on a table with a silver bullet in him. The mortician removes the bullet and Waldo springs to life killing the mortician. Waldo the werewolf then goes out into the world and finds two female med students who are doing a masters thesis on a vampire queen named Wandessa de Nadasdy. Waldo hates vampires so he decides with the help of the female med students that he his going to find this queen and kill her. This books sound just corny enough to be entertaining. Another book I wanted to mention was written in 1979 called The Majorettes by John Russo who was one of the co writers of Night Of The Living Dead. This book was written at the same time that slasher movies were becoming popular. The story begins when high school nerd Tommy Harvack who has a crush on a majorette named Nicole Hendricks, goes to meet her in the woods. Unfortunately for them they get murdered while on the rendezvous. The killer is not stopping there though, he has his sites set on killing the whole majorette squad. Can the police stop him in time? The Majorettes was originally meant to be a movie but when Russo could not get funding for it, he made it into a novel instead. A movie was finally released based on The Majorettes in 1987. 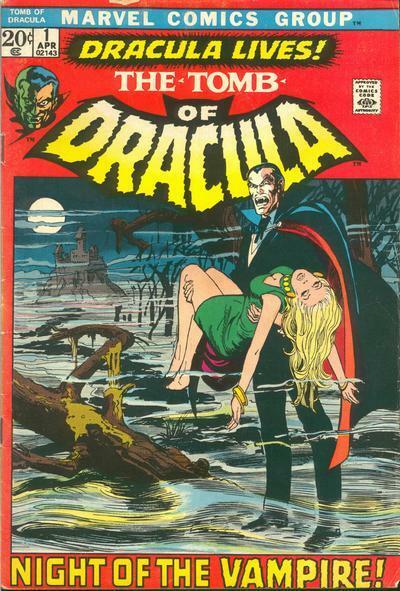 The 1970s also brought us a comic book that ran from 1972 to 1979 called Tomb of Dracula. This title was published by Marvel Comics, it was written by Marv Wolfman, drawn be Gene Colan and inked by Tom Palmer. The story for Tomb of Dracula was that Dracula was revived in the present day 1970’s and is being hunted by the decedents of the vampire hunters that once killed him. Tomb of Dracula also marked the first appearance of Blade who had his own comic series, TV series and three movies. If your going to talk about books of the 1970’s you have to to mention the biggest horror author of all, Stephen King. King’s first novel was released in 1974 called Carrie. Carrie as you probably know tells the story of a shy girl in high school who discovers that she has telekinetic powers and uses them to take revenge on the classmates that made fun of her. My favorite Stephen King novel was his second novel which was released in 1975 called Salem’s Lot. Salem’s Lot follows the story of a man named Ben Mears who grew up in Salem’s Lot Massachusetts. He moved away when he was 12 but has now returned to find the town a very different place. The streets are deserted in the daytime, the town has been infected by vampires and only a few town residents are left to stop the vampires from taking over. I don’t feel that I have to say to much about Salem’s Lot here because most people reading this blog probably at least know the story from the 1979 mini series or the 2004 mini series which followed the book closely. Salem’s lot was heavily influenced by Bram Stoker’s Dracula and Shirley Jackson’s The Haunting of Hill House which was recently mentioned in this blog. Sticking with the subject of vampires, I feel I also need to mention Anne Rice’s Interview With A Vampire which was written in 1973 and released in 1976. The story for Interview With A Vampire follows Louis as he tells the story of his life over the last 200 years. Interview With The Vampire spawned 11 sequels that I know of and also had a movie made on it in 1994. What’s your favorite 1970’s horror novel? Leave a comment and let us know.